I love you high and low. Love to blossom, bloom and grow. As a bear leads his cub on a breath-taking journey through sparkling starlit nights, past misty blue mountains and gushing waterfalls, he shows him just how special and loved he is. I Love You More and More is an enchanting celebration of the unconditional love and special relationship between a parent and child. 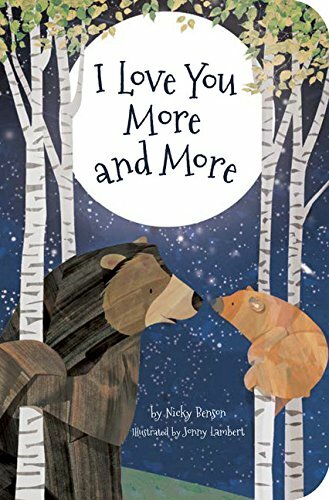 With a lyrical rhyming text, stunning illustrations by Jonny Lambert and beautiful silver foil title and trees on the front cover, this is a sumptuous tall-format picture book which would make the perfect gift for the little one in your life this Valentine's Day. This is a book where the illustrations do the talking. The text is a sweet, simple rhyme spoken by an adult bear to his/her cub but, to be honest, without the pictures it wouldn't be particularly special. Jonny Lambert's lovely illustrations bring the book beautifully to life. On every spread, the two bears are travelling together through a natural landscape created with a fairly limited colour palette. They see flowers, trees, other animals, mountains, a waterfall and lots more besides. There's no real story, just a constant affirmation of love for the cub, but there's plenty to talk about in the pictures which I always think is the mark of a good picture book. This is a book you'll come back to again and again and it's perfect for bedtime – reading it made me feel wonderfully relaxed and peaceful. Don't miss it!